The Safety Centre are pleased to announce the additional of a brand new range of Evacuescape Evacuation Chairs to our product portfolio. This Evacuation Chair range is designed to help the safe evacuation of mobility impaired occupants from a multi-storey building. The Evacuescape Evacuation Chair range has 3 different chair versions available. These chairs are designed to be operated safely by a single person. They all feature a harness to safely secure the evacuee onto the chair and all chairs are CE certified. 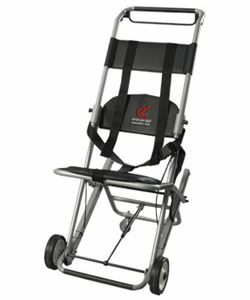 The Evacuescape EC1 Evacuation Chair is the entry level model of the Evacuescape range. This chair is suitable for being operated by a single person and has an impressive load capicity of upto 160Kg. It features a single strap safety harness and is designed and manufactured in the United Kingdom. The Evacuescape EC2 Evacuation Chair shares many of the same features as the EC1 version, with some additional features. This chair has a unique patented dual braking system which is used to control the speed of decent of the chair down the stairs. It also features a five point safety harness which ensures the occupant is securely fastened into the chair. This version can still be operated safely on stairs at an imressive angle of upto 44 degrees. The Evacuescape EC3 Evacuation Chair is a specialist Bariatric Evacuation Chair that can boast an impressive load capacity of upto 250Kg. This version of the chair features an upgraded steel frame to mean that the chair is suitable for Bariatric evacuation purposes. If you’re interested in this range of Evacuation Chairs you may also be interested in our Disabled Toilet Alarm and Deafgard Vibrating Pillow Alarms.